After a certain age, nobody wants to grow up. Well, at least I don't. The whole concept of having a family, settling down, thinking of people other than yourself, buying a practical four-door car...you know, all those things that involve thinking about people other than me? Well, it doesn't really appeal to me. I'm more of a two-door-hot-hatch-blow-up-all-my-money-on-me kinda guy. But alas, such is not life. Unfortunately, a lot of us have to grow up whether we like it or not. And if you're a petrolhead like me, you can deal with all of those things except one  driving a boring car. Well, now you don't have to! 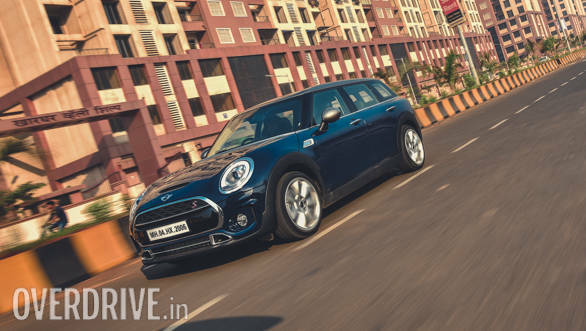 Say hello to the Mini Cooper S Clubman. It's essentially a three-door Mini Cooper S hatchback which, like you, didn't want to grow up, but had to. So like you, it's reasonably practical and, at the same time, bustling with excitement and dying to have some fun on the road. I mean look at it! The design alone says so. From the front, it looks just like the hatchback, but is wider by 90mm. It gets the same pulled-back circular headlights with the outlining DRLs, the hexagonal grille and two air inlets at the bottom of the bumper. Admittedly, the side and rear aren't the most attractive angles of the car, but they're not too bad either. The 4.2m length and the vertically split tailgate are quite unusual and take some getting used to. But then again, so does growing up. The way the split tailgate opens up is so unusual and new that it actually feels quite cool. But it's when you step into the driver's seat that you really feel like you're in the hatchback. 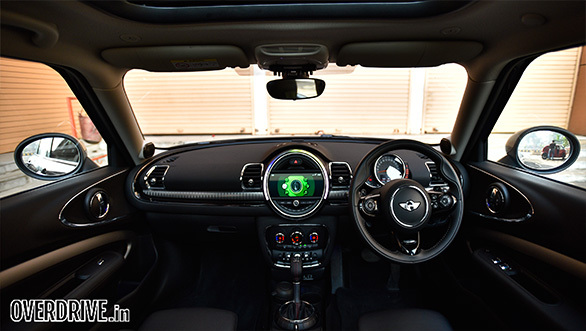 You'll notice that the overall dashboard layout is the same, but features a few new garnishes and trims like the zig-zag pattern running horizontally across the dash. 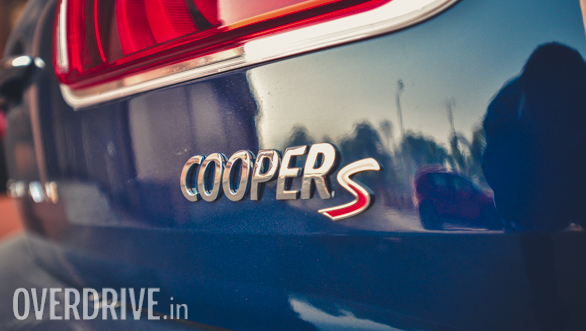 Almost everything else is identical to the Cooper S hatchback, right from the cool toggle switches to the instrument cluster mounted on the tilt/telescopic steering column. But what you'll also notice here is a button behind the gear lever with the letter 'P' marked on it. That's right, the manual handbrake you would have liked to yank around the corners is no more. Adulthood requires some sacrifices I guess, and I'm sure the family will appreciate that. Speaking of family, you'll find a lot of room at the back to comfortably seat two adults or uncomfortably seat three. The boot's got quite a bit of space too with a 360-litre capacity. For your reference, the Honda WR-V's capacity is 363 litres, which is quite large. The boot isn't inconveniently deep either, while the loading lip isn't too high. But enough of all the boring practical stuff. Let's get to something more fun  the engine. 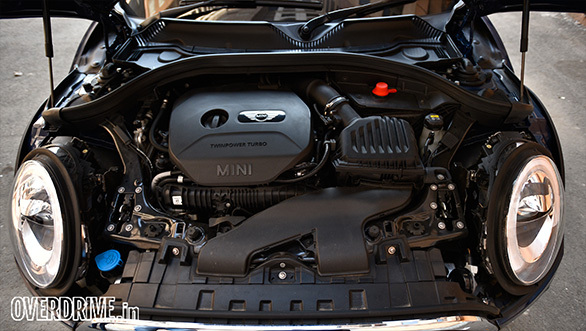 The Mini Clubman uses the same 2.0-litre turbocharged petrol unit seen in the Cooper S hatchback. 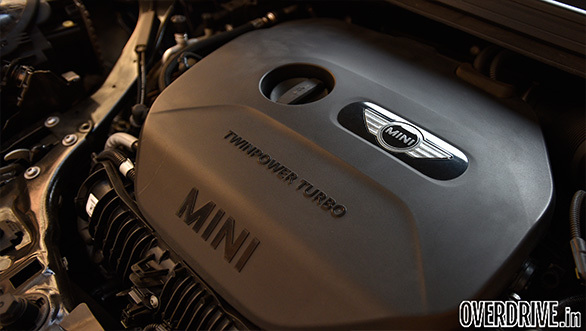 It makes the same amount of power and torque too  192PS and 280Nm of torque. However, it gets an 8-speed automatic gearbox instead of the hatchback's 6-speed unit. I've always loved this engine  it's free-revving, responsive, smooth and there's power in almost every part of the rev range. The engine gets three modes  Sport, Mid and Eco. In Sport mode, the throttle response is significantly sharper, making the engine feel a lot more eager. Oh and it sounds pretty good too! It's not too loud, but there is an enjoyably deep, raspy note when you give it the beans. Mid mode reduces throttle sensitivity and makes the car very easy to manage inside the city. But when in the city or cruising along on the highway, you're probably better off using Eco mode. The car doesn't feel sluggish and manages to return a decent efficiency figure as far as 2.0-litre 192PS turbo petrols go  13.74kmpl on the highway and 10.81kmpl in the city. While that might not sound too impressive, it's almost identical to the hatchback's efficiency figures. 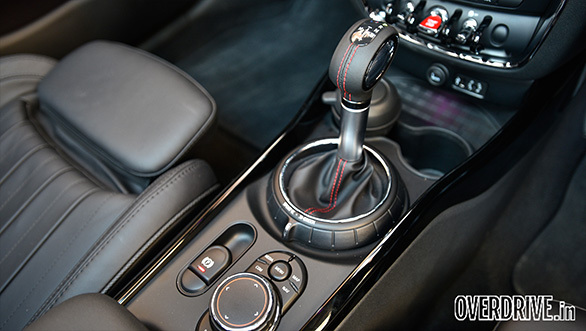 The Clubman's optional Sports transmission gets two modes of its own  a standard Drive mode and a Sport mode  along with paddle shifters. Like in the hatchback, the gearbox is a very smooth and quick unit  almost like a dual-clutch gearbox, I'd say. In the standard Drive mode, the system tries to keep the revs quite low by shifting up as early as possible. At the same time, downshifts are offered almost immediately when you modulate throttle input. The advantage of an 8-speed unit over the hatchback's 6-speed gearbox is improved highway ability. Even at high triple-digit speeds, the engine doesn't feel strained at all because the transmission keeps the revs quite low. At the same time, at no point does it feel like eight gears are too much either. If you feel like some sporty driving, just slide the gear lever left into Sport mode and it immediately shifts down a couple of gears. This ensures that you're always in the power band and not left bogged down at any point. Oh, and there's always the paddle shifters. There's never a dull moment with them around! With the engine and gearbox set to Sport mode, we managed to get a 0-100kmph time of 7.19s. That's pretty impressive considering Mini claims the hatchback will do the same around half a second quicker. If you're not already sold on the idea of a Mini Clubman, don't worry. I'm only just getting to the best part  corner carving. To me, a Mini isn't really a Mini if it doesn't feel nimble, light on its feet and quick around a corner. And I'm glad to say that the Clubman checks all these boxes! Considering its length, it doesn't feel as nimble or as easy to weave through traffic as the hatchback. That said, it does feel as nimble as a 4.2-metre long car can possibly get. The steering is a real delight to use with very sharp turn-in and good feedback too. 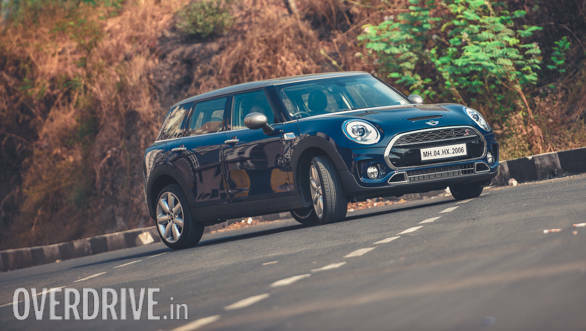 This, in combination with the optional adaptive dampers, makes the Clubman an absolute riot to drive. No matter what I tried  long sweeping turns, sharp turns, quick side-to-side transitions  the car just stayed flat! It's so good that sometimes you actually forget you're not in the hatchback and push really hard. And that's when you're reminded that you're not in the 3.8-metre three-door. 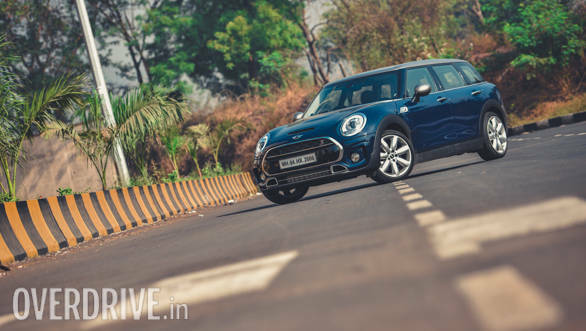 The Clubman isn't as tail-happy as the Cooper S hatchback because of the longer wheelbase and instead, it tends to understeer if you push too hard. But that said, it's still a better handler than most similarly sized cars. Additionally, the traction control isn't too intrusive and lets you safely have a lot of fun. 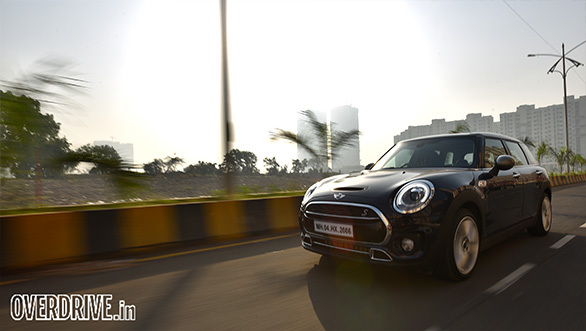 Even in a straight line or on the highway, the Clubman will charm the pants off you. No matter how fast you go, the car just sticks to the ground and feels very planted. In fact, the faster you go, the more it feels like it's sticking! But again, this car isn't just about what you want, remember? Your better half has to approve too! Don't fret though, because the Clubman can be quite comfortable. Switch to the Mid mode, and the dampers soften up, making for a very supple ride. The suspension itself is pretty quiet, but the run-flats do thud over bad roads if you don't slow down. While the car never scraped over any of the speed breakers or over bad roads, I was more concerned about the tyres. The test car we got had the optional 18-inch wheels wrapped in 225/40-section Bridgestone Cinturato P7s, which look great, but don't seem very practical for our conditions. The standard alloys are a 17-inch set with 225/45-section tyres, and seem like the more pragmatic choice for a practical guy. Speaking of practical choices, now's the hard part. Like with all the Minis in India, a lot of the kit, which you also see in these images, don't come as standard. 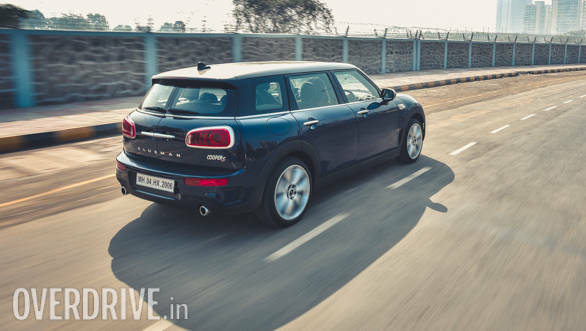 The base Mini Clubman costs Rs 37.90 lakh (ex-Delhi), and for that you get the engine with the three driving modes, a basic 6-speaker sound system with a smaller infotainment unit and your basic creature comforts. Want the lovely panoramic sunroof? Sure! You can have it for 'just' Rs 1.25 lakh. 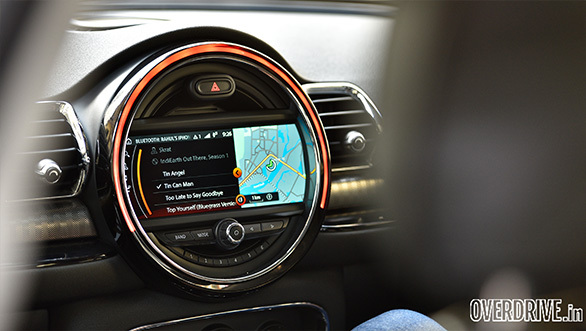 Want the new, larger touchscreen infotainment unit? Of course, you do  Rs 2 lakh for the Wired package which also gets you navigation and a built-in 20GB hard drive. Want a reverse parking camera? Okay, that'll be Rs 45,000, please. You see where I'm going with this, right? But being practical isn't about getting the things you want, but the things you need. So I'm going to spec the car with just the things I'd need to make it fun, yet practical. Here we go. The Sports transmission  Rs 25,000. But getting a Sports transmission makes it mandatory for you to get the Sports steering which costs Rs 30,000. Adaptive dampers  Rs 80,000. In India, you need a spare wheel, so that's another Rs 12,500. I'd love that amazing 12-speaker Harman Kardon sound system, but at Rs 1.15 lakh, I think I'll skip it. With all this kit, the cost comes up to Rs 39.37 lakh ex-showroom, so you can expect the car to be over Rs 50 lakh on-road. I know that sounds like a lot, but considering what you get for the price, I'd say it's a pretty good bet. This, especially because there's nothing else like it in the market, which gives it an air of exclusivity too. With this, erm, hot-hatch sports station wagon thing, you're essentially getting a great balance between fun and practicality. I know I can't afford a Mini Cooper S hatchback now. But maybe, just maybe, if I start saving and planning my finances from today, I could maybe just buy a Clubman when I'm, you know, a family guy.